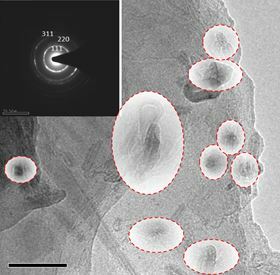 This transmission electron microscope image shows the nanodiamonds that formed in samples of nanotubes fired at a target at high velocity. The insert shows the diffraction pattern that identifies the formations as nanodiamonds. Image: Ajayan Group/Rice University. Materials scientists at Rice University have succeeded in making nanodiamonds and other forms of carbon by smashing nanotubes against a target at high speeds. Nanodiamonds won't make anyone rich, but the process of making them will enrich the knowledge of engineers who design structures that can resist damage from high-speed impacts. The diamonds are the result of a detailed study into the ballistic fracturing of carbon nanotubes at different velocities. The results, which are reported in a paper in ACS Applied Materials and Interfaces, showed that such high-energy impacts caused atomic bonds in the nanotubes to break and then sometimes recombine to form different structures. Led by the labs of materials scientists Pulickel Ajayan at Rice and Douglas Galvao at the State University of Campinas in Brazil, the study is intended to help aerospace engineers design ultralight materials for spacecraft and satellites that can withstand impacts from high-velocity projectiles like micrometeorites. Knowing how the atomic bonds of nanotubes can recombine will give scientists clues for developing such lightweight materials by rearranging those bonds, said co-lead author and Rice graduate student Sehmus Ozden. "Satellites and spacecraft are at risk of various destructive projectiles, such as micrometeorites and orbital debris," Ozden explained. "To avoid this kind of destructive damage, we need lightweight, flexible materials with extraordinary mechanical properties. Carbon nanotubes can offer a real solution." The researchers packed multiwalled carbon nanotubes into spherical pellets and fired them at an aluminum target from a two-stage light-gas gun at Rice, and then analyzed the results of impacts at three different speeds. Co-author Chandra Sekhar Tiwary, a Rice postdoctoral researcher, noted the few nanotubes and nanoribbons that did survive the impact were often welded together, as observed in transmission electron microscope images. "In our previous report, we showed that carbon nanotubes form graphene nanoribbons at hypervelocity impact," Tiwary said. "We were expecting to get welded carbon nanostructures, but we were surprised to observe nanodiamond as well." According to Ajayan, the orientation of the nanotubes, both to each other and in relation to the target, and the number of tube walls were as important to the final structures as the velocity. "The current work opens a new way to make nanosize materials using high-velocity impact," said co-lead author Leonardo Machado from the State University of Campinas.